Re-ordering the organization’s genetic code for innovation. As we enter 2012, what really disappoints me is that we still have not cracked the innovation DNA code sufficiently to embed this within the organizations genetic principles, structures or systems for completing an everyday innovating business. Why is that? I see no reason why innovation cannot be a clear (integrated) management discipline, shared, taught and fully aligned with an organization’s strategic intent and execution. It needs to have a set of molecules that carry the ‘genetic’ innovation information in logical and a comprehensive arrangement, of its separate elements. These need to be strung together like all living cells by a set of clear rules. The code order defines the sequence, the “alphabet” of the organizations ability to innovate. Well that is how it should look if we want to allow innovation to enter the present DNA of an organization. Innovation cannot sit outside or be run in parallel but it needs to form part of the essential organizational code. I am convinced innovation can be implicitly understood but I still feel there is an awful lot of conflicting advice being offered that must leave many confused. Let me add to the confusion! We really do need to break down the existing code of organizations DNA to ‘implant’ innovation within the building blocks. I feel we have four intervention points to reorder the thinking. An organization rises or falls by its decisions. The people placed in the decision making roles determine what should be going on and what, who and why this (set of) decisions are right for the direction and health of the organization. This is where the vision, the mission, the strategic intent ‘kick-in’ and innovation needs to align to this to achieve the aspirations needed and hopeful growth. Innovation needs to be deeply embedded in this, it needs to be seen, understood on its part it must play. It needs the other part here, the transferring of the rights- the right to think, get involved and where and how they participate in creating something. People need to be invited in. Knowing the objectives, knowing the limits, boundaries and having clarity on the incentives to innovate are crucial. Knowing the underlying values, the beliefs and the encouragements for adding to the climate to innovate can motivate or destroy. Innovation needs not just objectives but a clear understanding of the degrees of freedom and encouragement being made available. This becomes the point of understanding a common language, knowing the policies and key principles to stimulate and further strengthen innovations role it plays. Motivation forms the decision- making body within the alphabet on our abilities to innovate. The intensity of knowledge, the flow of information ‘fuel’ the opportunities that need working upon. I’ve written previously on absorptive capacities (http://bit.ly/mV7zjP ) about learning to absorb new innovation knowledge and describe this part of the DNA need in some detail there. Also I wrote earlier on the need to move towards a more distributed innovation model (http://bit.ly/b38ixv ) describing the flows for gaining more engagement and deeper involvement. It is the consistent, open flow of knowledge and information in stronger collaborative platform ways that will be the spearhead and stimulation points for innovation to be valued and seen for its worth. The coordination and collaborative nature of innovation really needs to be engrained in any DNA and everything that looks like a silo, you need to have some form of ‘bunker busting’ way to neutralise this really harmful effect on any innovation organism. Innovation is often very uncomfortable to embrace. It chips away at well established processes and structures. The power of established processes are the bedrock of organizational memory and the skill to ‘unpick’ those that hold back innovation (for growth) from those that unite the often difficult task of managing across an organization is really challenging. There are ‘points of conscious choice’ in what to abandon, what to loosen up and what to adopt. Having people who are skilful at recognizing the implications becomes vital. They need depth of understanding across the business, they need to seek a ‘power’ balance and they can’t afford to upset (too much) the regular operating rhythm unless it is seen to be a better way forward. Often innovation is incompatible with ongoing operations but usually needs just targeted organizational change. What is critical in my mind though is that innovation cannot be isolated from ongoing operations; there must be a continued engagement and ‘creative tension’ between the two. What is clear you do need a formal, intentional resource commitment to innovation and its ongoing integration, it is most unlikely to be organic. We need to identify all the innovation impediments. To make any transition, to embed any different DNA you do need a management makeover. Often today’s approaches to managing can conflict. Innovation can be strangled if you try to simply embed it into existing parameters. There are inbuilt inhibitors that are deep and systemic. Bringing to the surface the current political and ideological factors is no easy task. Spotting what is more innovation friendly becomes necessary and this is why having innovation visible from the top, integrated in all decisions draws out the impediments. The antibodies need to be recognized to successfully overcome them and then put in place a DNA sequence that works that has innovation as more of the core. “Relentless Innovation” by Jeffrey Phillips certainly helps. Jeffrey has written a timely book, released in December 2011. His basic argument is that today’s typical business model impedes innovation as the emphasis is still on efficiency (at any cost), alongside the cost-cutting for supposedly short-term gain. He terms this as “business as usual” (BAU) and it actively rejects the innovation effort, so much called for by CEO’s and needed for regaining growth. He also points his finger at a problem that has perhaps been ‘hidden in plain sight’ that the middle manager is plainly not equipped to manage innovation, alongside all of their other activities; something has to give or be put into a new balance. He believes he can achieve a ‘dual capability’ of achieving efficiency and innovation into a consistent set of capabilities that can become a core everyday discipline. I would recommend buying a copy and I feel you will appreciate and identify with many of the arguments laid out by him, for challenging the way we are still running our organizations. 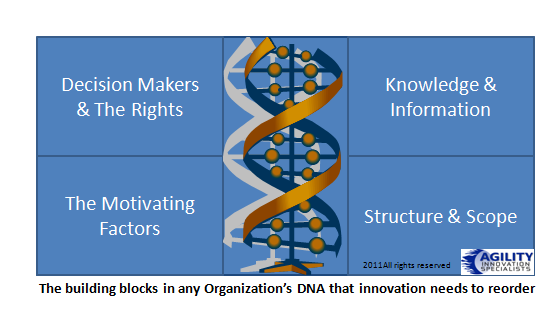 Making a shift needs a new innovation DNA alphabet. Innovation is a shift from those known, consistent, honed sometimes comfortable processes to unknown, unexpected and unusual ones. This makes anyone uncomfortable but if you demand really path breaking innovation you need to recognize your organization needs some significant changes to ‘allow’ innovation to be integrated into your existing processes. To initiate this shift and integrate innovation, it does needs a new rebalancing to take place. A new DNA sequence where innovation reorders the genetic code of the organization between what Jeffrey talks about of balancing the investments made in efficiency with the new needs of placing innovation within the sequencing required for any organization today, to deliver a healthier model for sustaining growth in the world 0f 2012 and beyond. Understanding the makeup up of the innovation DNA codes and where the parts fits within, and alongside, many of your existing practices is essential. We need to finally crack this code in 2012. Just remember to ‘invite’ people in who understand the consequences and impact points and can ‘graft’ the right gene into the right order for the synthesizing process this needs (for you) to be successful. Jim turned from staring through his microscope, rubbing his eyes, and looked out the window. It was dark and the snow was really coming down. 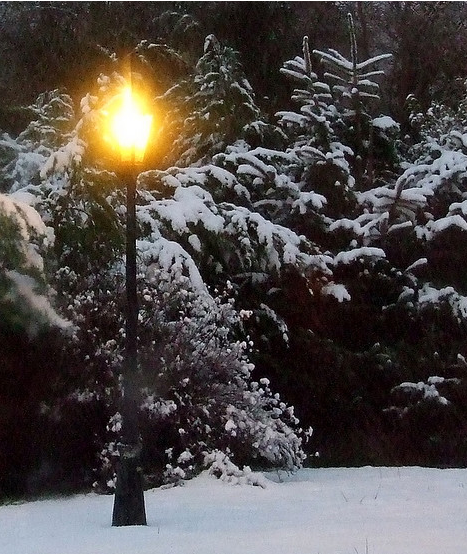 The lamppost had turned that funny yellow colour, as more and more snow was falling in the car park and building those little domes of snow on top of everything. It was the Friday before Christmas, the last day in the office for three days. Jim was looking forward to getting home tonight, so he could share some time with the family after having been on a frantic trip to four different cities, on three continents, in seven days, to meet with his different team members. This was quickly put together to coordinate the project they were all working upon, comparing notes, setting some goals for the coming weeks. He was tired but also troubled, apart from all those delays at airports, different hotels and long days and growing jet lag this was not the main reason for his headache. He had been working on finding a solution for a molecule that would make a significant contribution to his company’s product pipeline, and they certainly needed this ‘breakthrough’ as 2012 will be a ‘watershed’ year in his industry. Jim, like many others in research and across his company were worried, really worried. According to what he reads billions of dollars and many of the larger blockbuster were falling over the “patent cliff” as it has been dubbed and he was wonders what they means for him. He has heard rumours, swirling around, a little like the snow outside, that yet another re-organization is in the works. More uncertainly to face and it will do his case no good if he can’t crack this particular problem, the reason he went ‘racing’ around the world to visit the other research centres in Rio, Brazil, Shanghai in China, Jurong in Singapore and Basel in Switzerland. Stars in the Universe always twinkle. Jin loves his work, he tells many of his friends willing to listen to his same old story: “molecules are so small that there are more molecules in your body than there are stars in the universe!” His kids love that one as he then grabs them and tickles them so they ‘squeal’ with delight. Also he never tires to tell anyone who cares to listen or ask what he does. Those that knows Jim always expect him to make this comment or a similar one when the extended family gathers around the Christmas table, to keep everyone aware of his contribution on this world. He often gets ‘ribbed’ on the number of molecules he seems to be adding himself and Jim shakes his head, dismissing them all as “ignorant peasants” or something more specific and then laughs out loud along with everyone else. What’s so special in Jim’s mind about molecules is always their unique shape that allows it to interact with other molecules. The interactions between molecules made up of black carbon atoms, white hydrogen, red oxygen and nitrogen atoms are always buzzing around in his head when he peers into that microscope. Jim enjoys his work, even he would happily stand up and state he is proud of his contribution but at this moment of time he certainly needs to find this solution to his current vexing problem, as the deadline set to solve this has been ‘laid down’ from on high and that always has some darker sides to any ‘edict’ like that. Hence this was partly why he went on this last minute dash around the team, to find a solution to their problem. The bigger problem is, it is simply getting tougher, is the constant message he is getting down from the top within his company, not only to come up with new drugs, as he well knows, but also to convince insurers and the government to pay for them — unless they make meaningfulimprovements in health, at a reasonablecost. Everyone has to lift up their game, accelerate the work and offset some of those worrying times ahead if possible, well at least try to make a contribution that is acknowledged and hopefully appreciated by others. Suddenly he hears that familiar sound of an incoming email, he turns around to take a look as it gives him a chance for some distraction. Normally he would not be feeling this about any last minute emails before he heads off home for the Christmas break. The email was from Lo Ping, in the research centre in Shanghai. Quickly reading it he suddenly brightens up. Lo has found a possible breakthrough to the problem. It seems after Jim’s visit and explanation, Lo Ping decided to reach out to their collaborators around the Asian region and pose the question to them. One of the research institutes in Thailand they work with, thinks they might have an answer, something they were working on for another company but in another unrelated industry, so they can find a way to explore this in some form of open innovation collaboration. Jim knew Lo Ping would not bother him unless she was fairly sure this would likely be the answer he and his team have been working hard to solve. Open innovation has been a great help for him to bring other ‘like minded’ people into the discovery process. Lo Ping with her usual humour writes “here’s the deal Jim, knowing you will be sitting with your feet up over the next few days while some of the rest of us work, I will fly to Thailand, investigate, work on the testing to see if this does make the breakthroughs and then do some more work in my labs before you get back in three days- how about that?” Jim smiled, knowing Lo Ping and her team they will deliver as promised. The Shanghai lab is a twenty four times seven one, meaning it is working 24 hours a day, every day. Comparing that with the one here that Jim works in, in the US it only works, at a pinch, 9 to 10 hours, five days a week and that often causes at head office many comments on productivity, cost efficiencies etc, etc. These constant global comparisons just add more pressure. He quickly emails back to Lo Ping- “sure, go for it and thanks, I owe you one”. Within seconds a further email comes back from Lo Ping suggesting: “well just remember Chinese New Year is on 23rd & 24th January this year and if you could shift that review meeting to a little later as a return favour, it will allow me to release some of my team to have time with their families- agreed?” Jim laughs, he knows Lo Ping and her way of conveying the needs of her team, also means her. He emails back “sure, providing you have those results on my desk in three days”. Only a ‘smiley’ is the reply. Wow, that is a great relief thinks Jim, if we can find the breakthrough, make a collaborative deal with the Thai lab to share in the benefits we might quickly get back on track. Some quick emails off to the team, then to legal in Singapore to be on the alert to join in the negotiations, a copy to the central open innovation legal person in New York so that it will get the legal wheels grinding along as well. He thinks he needs to pull in that favour following his buying of the meal in Singapore last week for the team, including the lawyer. Sometimes those face to face, social meetings pay incredible dividends and he knows Satvinder Sirajay is very dependable and wants to help especially after they found out over dinner they had daughters playing football for their schools. Knowing each other in this connected world does help. He recalls listening to Don Tapscott a few weeks ago, talking of the Age of Network Intelligence where the five principles now apply. These are ‘collaboration, transparency, sharing, interdependency and integrity’ and Jim just felt he had ‘touched’ each of these within this set of events. So these guru’s do know what they are talking about after all, he thinks. That suddenly prompts him to remember to pick up those two books he had ordered from Amazon to read over this Christmas break. One he needed to read to prepare for his innovation session to his research colleagues straight after Christmas- “Best Practices Are Stupid- 40 ways to out-innovate the competition” by Steve Shapiro and the other to help him find ways around one or two rather stubborn middle managers that seem to be blocking his initiatives from ‘seeing the light of day’ at the senior level. Yes he even liked the title on that one “Relentless Innovation- what works, what doesn’t” by Jeffrey Phillips. His smile suddenly changes though as he hits that cold blast of air, quickly pulling up his coat collar to stop the snow from trickling down his neck but it didn’t matter he was happy. Happy to share Christmas with his family, happy his problem seemingly was about to be solved somewhere else in the world while he took some time off and happy about that decision to go around the different research centres to lay out the problems. He felt this gave them all a personal identification and shared understanding of what was needed from them as a global research team, working on innovating the next breakthrough for their company. The only shudder he felt was the need to face up to the merger issues that were announced. Still that was for after Christmas when he arrives back to hopefully find the team working away in Asia has found the solution and that positive message he could then gives the ‘powers that be’ the good news. Hopefully it will remind them of the many reasons why they were such a powerful collaborative team, essential to the future of sustaining their position in the market. “Yep”, thought Jim- this is certainly a crazy, connected world but today it was simply a great collaborative feeling one gets on working on solving a problem. One, that in his mind, would lead to a potential innovating product that will save lives. Not bad as a great feeling as Jim heads home to the family and celebrating Christmas and all of what it means in our lives. Enjoy your Christmas and happy innovating in 2012! Stay optimistic. Some weeks go better than others; I’m sure we all have found that. This last week has been a good one for me. I think my weeks are getting better the more I read and explore other peoples thinking or find that ‘precious’ time to have a good conversation or two- they simply spark and strengthen my identification with critical points for innovation and its need. This week I was talking to Jeffrey Phillips in one of our regular exchanges and he was asking me if I took some time out, straight after Christmas, to reflect on the past year and also begin to sketch out some of the thinking for next year. I love mind maps to capture these evaluations but I also like to ‘squirrel’ away lots of insights into a folder (scrapes of paper, articles, insights, references and visuals) that sits on my desk, for one of those moments I need reminding or prompting me to get back on track. That folder can stay unopened for weeks but it is a constant ‘drop box’ for those reminders. Unrelated connectors often occur for gaining new clarity. I then had two unrelated prompters to get me thinking. One was an article by Linda Naiman from her blog on “Reflections on Working with Centers of Excellence” (http://bit.ly/ru0Xnw ) talking about arts-based business learning and the need for more humanity and fewer algorithms to develop emotional intelligence and empathy. Part of Jeffrey and my conversation had been on the value of art to stimulation and where I had argued that it had its place in business of relaxing the brain to absorb more information and knowledge than just business only related aspects. I do feel the business brain has a certain ‘tightness’ and it needs a different stimulus to allow it to relax and let go. I liked that timely coincidence from Linda just hours after the conversation, a sort of reaffirming of a growing need. Something I must become more conscious of in my own approaches. John was suggesting too propose a new lexicon, in hopes of better structuring and focusing discussions of innovation through its constituent parts, and related concepts. His final one struck me with such force; it stopped me in what I was doing to really think about this, he suggested human ingenuity. “Ingenuity” , he offers, is perhaps the most under-represented discussions of innovation, and at the same time, one of the most critical elements for addressing the challenges facing global society today. Many of these, from climate change to economic disparity, are escalating at a staggering pace that requires precisely the acceleration of the innovation process that ingenuity can provide. Ingenuity is my watchword for 2012, maybe it should be everyones’. It was after this I realized the force of this word and how it will play such a critical part of how we manage in 2012. We should recognize ingenuity and its importance in the innovation process as it takes you from an idea through to an achievable dream. It is the art of overcoming and winning against, sometimes, impossible odds to really achieve something different. Ingenuity, invention, inspiration, improvisation, ingenious all are leading to innovation in the developing world that seem to offer initiatives that create ‘leapfrogging’- that ingenuity against overcoming often intractable problems. You do see ingenuity occurring more and more to resolve obstacles. It is lying within us all to find and use. Wikipedia suggests the term ingenuity refers to the process of applying ideas to solve problems or meet challenges. The process of figuring out how to cross a mountain stream using a fallen log, build an airplane from a sheet of paper, or start a new company in a foreign culture all involve the exercising of ingenuity. Human ingenuity has led to technological developments through applied science, but can also be seen in the development of new social organizations, institutions and relationships. Ingenuity involves the most complex human thought processes, bringing together our thinking and acting both individually and collectively to take advantage of opportunities or to overcome problems. Ingenuity is often inherent in creative individuals, and thus is considered hard to separate from individual capital, more of personal quality. I think it actually can be developed, encouraged and worked upon in collective environments, it is not just individual. Ingenuity is that pioneering spirit– to find those ways to overcome natural obstacles for tomorrow’s solutions that will add new vitality, new prospects, and new horizons. Ingenuity sits alongside innovation; they are blood related, both essential for evolution and both in-built in us as a species waiting to be released so we can be able to push the limits of possibility. Creativity and ingenuity—creativity is also a personal quality and a collective one, creativity is also inherent to ingenuity, there is ingenuity in music (the jam), in painting, in design. It is often explained to achieve certain mastery for instance in improvisation you do, paradoxically, require intensive detailed preparation and equally innovation needs to be a sustaining process. It is the constant practice, the search; the experimentation is the result of many hours of preparation and reinvention, learning and adjusting. We must find creative ways to transcend and overcome barriers and as Linda Neiman writes “arts play vital roles in helping us find our authentic voice, and remembering who we are as human beings”. Ingenuity flows from this ‘well’ if we allow ourselves time to tackle those seemingly intractable problems that are around us today. So a word for all of us to carry into 2012 with a real mission – ingenuity. We need solutions………through ingenuity……..in response to market needs and many problems we are facing around the world as we enter 2012. It just struck me as this is the word that should govern my approach to my advisory business next year. Ingenuity everywhere needs to emerge. Recently I was having a ‘conversation’ with Alexander Osterwalder concerning the limited adoption of the Business Model Canvas within large organizations. I was asking him if he agreed and if he had any thoughts on this. Now if you know Alex, he is either jetting off to somewhere in the world to keep spreading his Business Model gospel, or about to get immersed in his next idea associated with it, so these conversations are grabbing him through twitter or short email exchanges. The books claim of “You’re holding a handbook for visionaries, game changers and challengers striving to defy outmoded business models, and design tomorrow’s enterprise” on the cover, it sets itself up for the imaginative person striving to alter the status quo within their business. Without doubt this book weaves design throughout, to give you a visual feast through its canvas approach. It leads by example in wanting to replace or alter the more established business book with its style. It is a beautifully designed book to enhance the pleasure of reading it and it is not a typical business book, it conveys the essentials that you need to know quickly, simply and in a highly visual format. So what is holding the large organization back? I’ve previously commented Business model innovation meets one of today’s business needs. Many of the tools we have relied upon for decades just simply do not ‘articulate’ the job on hand. Models enshrined in business folk law like Porters 5 forces, Boston matrix and a host of others gave insight, were very analytical, but gave declining comfort on foresight and this is what is needed today. We have seen the significant shift from internalizing to externalizing through open innovation. In seeking differentiation, businesses have had to loosen up and give up some of their ‘control’. The world seems more dynamic and complex, it is a place where you have to find a unique position in the market, and one built on competitive advantage seen through the eyes of your customer not from within your four walls. The business model captures ‘breaking’ opportunities and clarifying existing value propositions, so why this lack of uptake? Alex spends an incredible amount of his engagement time with entrepreneurs, small business owners and to a far more limited degree, I sense, within the larger organizations. Is this one reason? There is only a certain amount of time and I’m sure Alex has to be selective with what and where he wants to deliver this message across the world. He might though, need to draw in a fellow BM disciple, who could focus and spread the message to the larger organization as his ‘patch’. Is his message skewed towards the entrepreneur more? Even the subtitle on the front of the book might be a little challenging to the incumbent. “You’re holding a handbook for visionaries, game changers and challengers striving to defy outmoded business models and design tomorrow’s enterprise”. Maybe those (the majority in large organizations) find this more of a “oh, I wish” but are simply not sitting in that sort of position to change the world? Maybe the book needs a mini-repositioning? Or a further one where a new book brings all the ‘collective’ knowledge that has been learnt since the first one, all together as a companion, or as a field guide? Is it also because it might be hard to imagine that you can capture a complex picture within a one page canvas? Within large organizations you deal in pages (I mean pages) of business plans, marketing plans, briefing papers and countless justifications. Could a business model be captured so easily? Well actually yes, if anyone is wondering. Or more than likely, it is far more to do with that classic ‘lead and lag’. Larger organizations are slower in adoption; it is just a matter of course. Be this in new technology, new processes, social media or a host of new things they tread more cautiously, they are slower to adapt. Those that get ‘it’ internally spend often frustrating months, sometimes years, trying to convince others to make a change, to change a process, a planning structure, even a widget within an established product that often holds it back. Then the CEO reads it in a magazine, hears it from a friend and away we go. Why not buy him/ her the book and save yourself the time and trouble! Irrespective of the answer to any of the above, my question here is: “can they afford to keep on ignoring a brilliant tool? One that will help them ‘galvanize’ the understanding of their business model and provide an amazing tool to explore other potential ones? So the BM Canvas and its value to large organizations. BMI provides an increasing value, my opening set of arguments. It can help discover new perspectives on challenges, also new perspectives on solutions. These perspectives can be new insights, new customers, new resources and new channels. Framing BMI in the canvas approach can underpin the Business Case through the nine building block analysis and provide a great one page justification. It can define needs- needs in the market, needs required from solutions and their impact. It can compliment ‘jobs-to-be-done especially. It can investigate value propositions (ranking, impact, capability, competition). It can help investigate higher impact propositions (value- based, enhanced economic, applications etc) to stimulate internal thinking and greater generation of potential BMI’s. It can form the basis of any model for showing where the money lies in potential profit, the possible costs and the resources needed. It can help in evaluating competition or watching for new entrants if ‘it’ or you understand the needs of the customer and where opportunities might lie. It can explore and explain consumer thinking (pre and post discovery and execution) in easy visual ways. It can be used as a neutral observer, uncovering opportunities or validating them in other industries that today may not be relevant but need to have a ‘watch’ placed upon them. I call these my “large organizations eight powerful reasons to adopt the Business model canvas” and place all the options in front of you, to be explored, to be tested, to be given a decent trial. To simply explore new business models as the book originally sets out in the how, what and where of doing this through the canvas approach. To ‘map’ changes to existing business models as they evolve or need to pivot differently. There is a growing body of work on the pivot by Steve Blank and Eris Ries. This is not exclusive to the entrepreneur, where they have tended to focus but much of their thinking can be applied to the larger organization to learn, understand and gain from (http://bit.ly/bYhHwQ and http://bit.ly/1fpIpK ). Just spend some real time on these two sites, it is time well worth spending to learn and challenge your current thinking on many approaches to your market and knowing the different value generation points in any engagement with your customers. To sketch out competitors positions to explore possible opportunity gaps should be one of those consistent ‘habits’ that so many large organizations often have a real blind spot to undertake and then get caught out and surprised when they see their share slipping away. The BM Canvas can spot and track competitors. Use it as a dashboard for innovations that have an impact on existing business models. Whenever you have any major BM change you capture it on your BM Canvas so all above and below can see the change. Again Steve Blank has been pioneering this concept for using the BM Canvas to ‘signal’ significant changes that he as a VC investor really only needs to get involved in. This can apply also as a ‘trigger’ point for communicating significant changes happening, up and down the organization. Use it to compare business model components across countries where different models are being applied to build businesses. This enables all involved to quickly focus on the differences on these operating models and market formations to get quickly at strategic discussions. This gives the visitor clarity and draws out critical ‘talking points.’ for allowing the visiting fireman to actually say more than “how can we help” but “let me show you ways to be safe.” It brings everyone onto the same value proposition and to rapidly explore the different options far more quickly than through those countless power point slides we have all endured, explaining each of the factors within the market. It gives business reviews a (fantastic) template. Try it! When you are pitching for funds it provides the top picture that others can quickly see and appreciate the why and how- they ‘see’ the value and the $$ potential, Again this has been grasped by some of the more enlightened venture capital investors, just wanting to know where the money is coming from, and then when the changes occur, as they always do, why the ones running the business made the changes from the original BM proposition. This offers ‘intelligent enquiry’ not getting involved in the running of the business but supporting owners or business managers with appropriate experience to compliment theirs. To have ready alternative scenario’s for volatile business conditions as ‘early ready’ that have mapped out potential changing conditions and where and how the business model might be adjusted or radically changed. The earlier ‘warning system’ pays in volatile times and we are all facing those at present. Rapid concept brainstorming to move into prototyping evaluation and market testing. Testing many different variations in small bite sized bets is rapid prototyping, do this through the effective use of the business model canvas. Testing fast in the actual market place new business models and then learning from them to improve the approach is absolutely critical. Get the customer involved. Just consider all of them. Learn the basics then experiment and you will not look back. I will be doing some more research and validation in the coming months on these, hopefully with large organizations willing to open up to this exploration and thinking. I do think the Business Model Canvas is about to go through a (further) tipping point, that crossing the chasm into mainstream adoption. Finding a common language is one of the critical tenets that Alex has been arguing with his Business Model approach. To find this common language and recognizing the value of this tool in many different situations can be valuable. Gaining this common voice to the business model, so all those around can understand it easily and quickly, is a major advance on what we presently use in having to explain our business models. For me there is something intuitive about the BMC approach. But to then empower everyone, to go out and seek increased value from new ones seen, that can then be communicated on one page, well that’s the real power of the Business Model Canvas, for any organization, large or small. The Accelerating Innovation Tide Across Asia. Asia is moving towards the remaking of the innovation landscape, I have no doubt about that. Over the next ten years or so, along with a number of other wealth generating activities, the centre of gravity for innovation will shift increasingly towards the East. I have been lucky to see part of this taking shape in my 15 odd years being based in Asia until recently. For twelve years I was based in Singapore and it is still, like all of Asia, on my advisory radar. Innovation in Asia is quite different; here are some of the dynamics. Others will follow. The combinations abound are ‘rich and heady’. With the attraction of fast growing markets, rapidly growing middle classes, rising education standards with millions of graduates emerging across Asia and plentiful state funding you have a powerful cocktail to ‘kick start’ innovation. For many countries in Asia they are well passed the ‘kick start’ and more into the establishing and maturing of their specific ‘brand’ of innovation. The West views Asian innovation through the wrong lens. Cultures have a complex make up too and it does influence our thinking. Cognition works differently it seems, depending on your cultural background and upbringing influences. Asia clearly ‘see’ innovation solutions in different ways. The generating of ideas, developed by different thinking approaches or modes is an interesting area to discuss further, but not here. One critical outcome leads to a more ‘collaborative’ approach in Asia, while the West would be more pursuinga far more “open’ one. Most of the Asian countries have for many years (thousands) been heavily controlled by the state and it is only recently that the heavy hand of regulation has been gaining a lighter touch. There is a present battles going on between market based outwardly looking approaches (for example in India & China) and those internal diehards, seen as solid nation defenders, wanting only a inward-looking set of approaches to solve many of the internal structural problems that still beset these countries. This provides a lot of tension on where the ‘push’ for innovation should go. There is still enormous scope for the ‘pull’. This tug of control and deregulation creates many mixed signals of state or market driven to evaluate. Asia has mastered much of the outsourced innovation, in many industries it is a world leader. Many of the countries have become technically adept and moving beyond fast followers into global outsourced leaders. The West simply comes at innovation at a different point and ,yes, you can argue it is more advanced but you do have to careful on this generalised statement. There are many emerging examples where the West is lagging the East and this will only increase unless a thorough, thoughtful analysis of the differences to give true ‘differentiation’ to focus precious resources behind them is made. Western policies still are too generalized when it comes to innovation areas they support. This needs greater ‘rifle targeting’ not ‘shot gun’ approaches. With so many knowledge parks, high tech zones and innovation centres of excellence springing up across Asia these are breaking down many past barriers of where innovation resides. Nearly every global company has transferred some or even all of its R&D research to specific places in Asia as protection, quality of researchers and the availability of grants and incentives becomes overwhelming not to take up. Knowledge is flowing East to the many hot spots and the airport connections simply accelerate this knowledge exchange. Scientists, corporate managers and serial entrepreneurs are connecting daily face-to-face or through all the available means open to them in technology and communications. We have been recently discussing reverse innovation, frugal innovation or appropriate innovation. All are well beyond ‘fads’ they are the outcome of products adapted for Asian markets increasingly finding new homes in the West, where many products are over-engineered, over-designed and over-spec. Stripping away what is not needed for customers is going to be the winning play in the next few years and the Asian centres of innovation development are more equipped to manage this within their type of innovation methodology and ‘proving’ grounds close to the production sites, mostly situated with these countries. Appropriate innovation is going to become a key battle ground. The other type of reverse is still the flow of reverse migration. The returning Asians, picked out by their countries’ roving ambassadors were attracted back due to the ‘heady’ cocktail mentioned above. Let’s be honest having your budgets cut, working through constant layers of ‘push back’ going on in the West (our famous red tape) or being fast tracked back into your natural society, with a more attractive package of money, contacts, feeding ambition and blending your Eastern and Western techniques, understandings and methods. Of course this is not always easy and many have found out the promise was not to their liking for many lingering inhibitors or obstacles. Many are staying and thriving. Asian countries do have a real intensity. This can make for some really insecure relationships with external collaborators. If you don’t start on the same page, in harmony, you certainly will never end on that same page without enormous blood, sweat and tears. The ‘prize’ within collaborations needs to be well worth it. All the Asian countries are as hungry as you can get for recognition as emerging equals to the West. Not only as it shows the virility, it does often shows the prowess and their adeptness. They still maybe weak on certain aspects but I don’t think the West can claim perfection! Yes Asia is often accused of fast following, exploiting and sometimes stripping down innovation emerging from other places or organizations but as they strengthen the intellectual property regimes and have well qualified researchers this will take on a really different level of sophistication. They will increase this type of ‘investigative’ innovation and produce many different and new products ‘schooled’ in reverse engineering or simply employing the latest skilled researcher, to break down the code, product or molocule and apply different intellectual logic bolted on to ‘sensing’ new value opportunities, exploiting the gaps. Again, Asians do think and research differently often at a higher level of intensity of purpose and with different biases and ideas of potential value. Exploiting their own intellectual property is clearly happening. So there are more brains, more ideas, more innovation centres working in increasing connected networks in Asia. These are not just Asian specific but global in their intent and dissemination. The West has to figure out what are its complementary skills to collaborate with this rising tide of innovation knowledge found in Asia. More innovation will clearly emerge from these collaborations but they are not going to be truly open, they are going to be open/closed, selective on what they bring. There is an ever increasing flow of people, ideas, technologies, followed by money and chased by different organizations to commercialise. The pace of innovation is getting faster and faster to manage. The art of orchestration comes to mind and Asia is a networked environment of inter connected relationships. It always has been in history, this time it is web driven making it even more ‘connected,’ fast and powerful. One Asian country is certainly not another for innovation. South Korea and Taiwan are both highly adapt at technology led innovation. They have highly connected networks of Conglomerates, Institutions and Government all drawn together on specific platforms to grow the internal competences of often the larger conglomerate operating out of these countries. Often it is seen nationally as a struggle for survival so they have to innovation- it is an imperitive. Yet state pressures and large companies often stifle new entrants or entrepreneurs through this extensive network- hence my open/closed analogy. Korea and Taiwan still have difficulty attracting foreign investors due to this closed up approach unless you are brining the technology or processes that resolve part of their jigsaw for moving up the innovation value chain. As for India, they are different, really different. They seem to stumble along but don’t be fooled by this. Their appetite for innovation is as big as it is for seeking food dependency. Indian’s have the premier networked system around the world. Someone once said it is not an innovation system but an innovation networked class of global non-resident Indians embedded in social and business systems anywhere from Silicon Valley, to Australia, to Cambridge, UK, Singapore or Boston. Indians debate, then think, debate and think again even more, and then find ways to innovate, often to get around obstacles others would have given up upon long ago. That is inbuilt within Indians who have had to navigate the roadblocks just to live in India on a day-to-day basis. They are really inventive. India is going to excel at many different types of innovation. India will become a real world centre for reverse or appropriate innovation. Then we have China. They are mobilizing their amazing resource of people, both educated and partly skilled into a powerful innovating machine. China has such ambitions for growth over its different economic state plans. Universities are ‘churning out’ more engineers than the West or near enough, it is attracting world class contributors to the education of the higher skilled and anchoring many multination innovation centres to build its momentum and depth. Presently China focuses on the ‘hard’ of innovation, the more right brain, less on the ‘soft’ left brain, so engineering, research both flourish. Creativity, design and market empathy all lag behind. They are trying to move from their quantity to a more quality perspective but this is going to be a hard road for them to travel without some real mindshift to a more open culture. The sheer power and commitment for making these ‘leaps’ in the global standing in many areas is frighening and innovation is in the centre of this determination to transform the Chinese society and be a global innovating powerhouse. When you look beyond these Asian innovation leaders you see Singapore constantly moving up the value curve. It has a unique model that attracts, employs and promotes innovation for its ongoing value creation. It stays fluid, adaptable and flexible in every way. It is like the bamboo- strong, pliable, can bend when it needs too but is powerful in its ability to not break, it is a constant surprise. It is always fast growing and very versatile. A place that keeps innovation in the forefront of its growth plans and systematically ‘picks off’ who and what it wants to anchor into its business in Singapore, to fulfil the growth plans of being a hotspot of ‘targeted’ innovation expertise. Singapore is famous for exploring boundaries in thinking and experimenting with lots of ‘seed’ money. Then you have Malaysia, Thailand, Indonesia, the Philippines, Vietnam, and the significant power of Japan- each has their own innovation model, one size or type does not fit all. Innovation in Asia is made up of many different models. I could dig into each but I will not for this blog. I’ve illustrated enough of the rising tide accelerating in Asia for innovation in enough ways. The innovation tide runs both deep and broad. Asian countries are remaking the innovation landscape. In the West it is not best to dismiss this phenomena and the West has to find imaginative ways to embrace these emerging innovation ‘tigers’. To learn to collaborate and play to traditional strengths may not be enough and this thinking beyond needs a real clarity of mind, believe me. Of course Asia is a fast learner and sometimes has incredible ‘blind spots’. To understand these and exploit them takes knowledge and the tide is certainly coming in fast. I was planning to go to this convention held in Brussel over December 5th & 6th, 2011, but eventually was forced to stay back in the office to complete some work for different projects I’m working on. Thankfully the main conference was on line so I was able to follow it, even if a little selectively. I’m sure you agree conferences or in this case a convention, are often ‘variable feasts.’ You never find everything appealing or valuable to you, but even at a distance I did find plenty of interesting areas in those I was able to watch. I hope they make many of the sessions freely available post convention as they have much to draw ‘inspiration and understanding’ from for all of us. I’m not planning this as a detailed report of the convention but to reflect and comment about why I think it provided a good contribution to the innovation debate(s), especially here in Europe. We do need to ‘tune in’ more on what these events can offer, if managed well, in depth and breadth of innovation’s scope. I’m singling out some of the more striking moments for me. The Innovation Convention is to become an essential part of the Innovation Union flagship initiative. It will take place on a regular basis to take stock of the progress made towards the objectives of the Innovation Union and to discuss ways forward with a broader perspective in the global innovative economy. This particular one was opened by the President of the European Commission, Mr. José Manuel Barroso and had about 1,200 or more selected participants. I got the impression Máire Geoghegan-Quinn, European Commissioner for Research, Innovation, and Science came and went. From my own past experiences you get invited to speak and participant yet, as it seems in this case, the convenor of the convention and responsible for innovation at the top of the EU were not around to listen to want you want to say. Clearly there are many within the DG research and innovation that can brief her and of course I hope they have that chance, there was a lot of great comments to reflect upon. Also what I gathered also from the twitter chatter she did spend some good time touring the many exhibitors participating as well. I am sure it is never easy as a convenor to be in all places at one time. Actually I would have felt the same with a number of different and interesting sessions with a choice of plenary, parallel and fringe sessions all competing for the participant’s time as well as visiting the exhibitions and ‘do’ the required networking. When you are able to attract such an array of top flight speakers and contributors to the innovation debate you are going to gain much and also desperately wish you could have had more. The opening session excellently facilitated by Ann Mettler of the Lisbon Council was threatening to be explosive, in a positive way. The panel after warming up got into their stride moving from global innovation, working with young people and examining many of the obstacles within the EU for innovation to overcome. I have to say Ben Verwaagen, the CEO of Alcatel-Lucent was terrific in throwing in the constructive bombs, Professor Sir Leszek Borysiewicz mopping up the fragments and Kiran Mazumdar-Shaw, Chair & MD of Biocon Ltd offering some really useful and insightful observations from her Indian perspective of looking into the EU. The two other participants Jean-Paul Agon, CEO of L’Oreal and Silva Venturini Fendi of Fendi Associates, keeping pulling us back to thoughtful aspects of where innovation works and why, from their perpective. This was simply a terrific session that could have gone on all day from my point of view with such an expert panel. You could not have asked for a better opening session on drawing out issues, problems and barriers but plenty of constructive solutions. One very telling takeaway was how the EU has got very insular, inward and introspective. In its time of crisis if the EU draws (even more) in, it will lose out eventually. Kiran Mazumdar- Shaw spoke about affordable innovation models, which we have ‘boxed’ here in the West as ‘frugal’ or possibly ‘reverse’ innovation. I like the real difference she offered- affordable. This reflects not just Indians current need as they are in many developing countries but increasingly will be the innovation approach here in the West. We do need to break this constant churning consumption habit and affordable and lasting need to be more built into the “West’s” changing set of watch words to adopt. The panel of Dr Margaret Chan, Director-General of the WHO, the CEO of GlaxoSmithKline, Andrew Witty and Marc Koska of Lifesaver gave us the sheer dimensions and complexity of healthcare and where innovation is playing its part. It provided shocking reality on the ground from Marc Koska and how his organization is innovating to overcome given issues. Also the really thoughtful ways GlaxoSmithKline are responding to their social pressures and commitments by opening up facilities, patents and working through a difficult path of innovation change going on with the Pharmaceutical industry. The whole change within Pharma is evolving in front of our eyes. Ms.Chan added dimension upon dimension on the complexity of world heath. You came away with what a multitude of problems there to be resolved and where innovation has such opportunity. I could go on and on about the values you could have taken away from these different sessions and the so many other outside of the main hall sessions. Those two sessions alone that I’ve mentioned fill you head with so much possibility and identification to engage and find distinctive ways to contribute. Often the draw in conventions is the big name key note speakers. Having Eric Schmidt, Google Chairman delivering his personal thoughts around “In Search of a Better Problem”, Don Tapscott on “Innovation in the Age of Networked Intelligence.” Michael O’Leary, CEO of Ryan Air opened the second day’s session with no more than anyone who has heard him before would expect; a lively, entertaining but valid set of criticisms and lots of poking fun at the EU on “Doing Innovation his (or Ryan airs) Way”. Michael O’Leary also led a Master class where young innovators presented their case to the audience and Mr O’ Leary contributing his views as a coach. Pupils for the Master Classes were provided by The European Young Innovators Forum and The European BIC Network and I sometimes wondered if the Irish wit, interpretation and thoughts offered by Michael O’Leary fitted. What did come across ‘in barrel loads’ was the need for passion, commitment, sheer determination and personal belief and that is just some of the attributes that Michael O’Leary has in abundance. As I mentioned conventions are a mixed bag. I really would have liked to have listened more to Sam Pitroda, the Innovation advisor to the Prime minister of India. Also for me, Will Hutton, executive vice-chair of the Work Foundation, just seemed subdued and not as insightful as he can be. Both were involved in the social innovation session. The climate change debate just seemed to ‘bob along’ and for many others I just had no time or opportunity to tune in unfortunately. The real personal disappointment was the Open innovation and public policy in Europe session offered by Professor Henry Chesbrough. The session was billed as “ large, vertically integrated R&D laboratory systems of the 20th century are giving way to more vertically disintegrated networks of innovation that connect numerous companies into ecosystems. Since innovation policy ultimately rests on the activities and initiatives of the private sector, it is vital that policy follows this evolution. New research and analysis on open innovation, for the Science Business Innovation Board AISBL, results in a series of recommendations for public policies that could, if implemented, improve the climate for open innovation to take place in the European Union – and thereby improve the competitiveness of the European economy overall. Taken together, these recommendations comprise an informal ‘charter’ for EU open innovation policy”. So I was certainly expecting some depth in this area of rich potential of open innovation within Europe. Why was it such a disappointment for me? Sadly it got caught up in a potted history of open innovation. We went back in time and at least fifty percent of the talk was ‘locked in the past’. I understand context and Professor Chesbrough is rich in this ground laying but I was hopeful we would be looking out in the future through his charter and he failed to get into living up to the billing. Instead he ‘hinted’ at this and promised more would come from a fringe session. Then you learn his report released by the ScienceBusiness will come out after this session, and cost 35 UK pounds to buy. So a document about open innovation and public policy in Europe, sponsored by a number of well known companies comes at a cost. That for me demonstrates closed innovation not open innovation. What a pity. The value of such a convention is what you gain out of it. I clearly was happy to ‘participate’ in this convention, even at a distance. The flow of ‘tweets’ also added value for me in gauging different reactions. It is getting interesting that one of the bellwethers at conferences is the level of tweet chatter, you do get some really interesting reflections and comments and these are getting closer to ‘live’ feedback. I heard for the ‘geeks’ in the convention they had limited space to type, while sitting in the conference hall, whereas I had the ‘luxury’ of being in my office, managing my day on two computers, listening to the convention, tweeting where necessary and getting on with the work that held me back from going. The organizers should be congratulated. It seemed to me to be a highly organized set of events attracting 1,200 people, plenty of high quality speakers and an awful lot of messages that bubbled up on innovation to reflect upon. I just hope there is a significant evaluation taking place on what was offered if it is going to be an annual event to take stock of innovations progress within the EU. For those that missed it, here is a link onto the site http://bit.ly/owtjiJ and let’s trust the EU makes available different video recordings so many more can share in this event and gain much from its contribution. Just check in to see if this happens as I’ve just been told it will take a week or so to do this. Also ‘pencil’ this event in for next year. I certainly did. Is innovation within the consulting sector under enough pressure? One: there is increasing less time available within the mid to large consultants to train, research and development for their services so as to differentiate themselves in innovation, in what is actually becoming even more of a crowded market. Focusing on maximising utilization and containing overheads and costs leaves less time to think and develop. Two: equally the cumulative experiences of clients in dealing with consultants, especially through the practice of more central procurement, has added more pressure on consultants not providing ‘added extra’s’ or to take more radical approaches to innovation solutions for the risk of being compared badly, not offering clear returns and then screened out of the bidding process. These trends are pushing it seems more incremental innovation in my opinion, but to overcome the concern that the often provided ‘one-size’ fits all that clients seemingly are wary of, what is increasingly happening is having more joint initiatives between clients and consultants. This gives the client more control- in my opinion where it should always be– and gives the consultant the potential for reducing overheads. So it seems innovation consulting is being managed through some constraining issues. My concern here is it can limit the potential that external advice can contribute and so it can fall short on stretching thinking around innovation that might actually, limit the final result the client is looking for out of their innovation activity. In the UK there has been an excellent study looking specifically at consulting and innovation, published in October 2011 entitled “Management innovation in the UK consulting industry”, by Dr. Joe O’Mahoney, a Fellow at the Advanced Institute of Management and a Lecturer at Cardiff University and commissioned with the Institute of Consulting. The aim of the report is to stimulate consultancies to be more innovative and therefore add more value to their clients. For me, this is an objective I would really welcome looking around at all the ‘safety first’ approaches going on in this area in many consultants, big and small. I’m sure many points are equally applicable to innovation consulting globally. It seems the increasing internal ‘invented here’ approach has been at the expense of seeking the external contribution and the belief that tailoring innovation to meet unique needs is more prelevent. Is this actually good? Are there other constraining factors at play here? Are clients simply reinventing the wheel, actually spending less efficiently? I would also suggest external advice is being used ‘selectively’ as it is more a lagging advice and not leading advice as in most cases of consulting. I get the impression within innovation advice that this client- consulting relationship is actually being constrained. Let me explain. I would argue from reading this study we are seemingly downsizing collaborative innovation between clients and consultants, restricting the potential for pushing out innovation. The consultancies as restricting their innovation practices and don’t make the type of investments that would help advance thinking? If I am right then we are actually constraining innovation. Consultants are possibly behind the game and are learning from emerging practices within the client and can only then provide limited support. Consultants are seemingly not providing “thought leadership” just reporting on best practices and what they are learning from this to apply it elsewhere. So consultants are reduced to supporting subsidiary roles. That is a pity if this is the case. This report helps identify the constraints to current models and allows some excellent insight for others to think through and see if they want to explore the potential and seize a different value proposition by restructuring differently around the depth of their innovation services and ‘jump ahead’ in the innovation learning curve. There are plenty of imaginative ways to do this restructuring that can continue to contain costs in the early stages that fit with these economic uncertain times and then apply the ‘gas’ as the recognition and value can be seen by present day reluctant clients. I would argue many clients are actually desperately seeking a more robust set of innovation activities to get more growth back into their businesses and good external advice can shorten the learning curve considerably if this is recognized as such. The perceived issue: a chain is no stronger than its weakest link. For me these constraints have some potential opportunity. I focus 100% of my time on formulating the innovation path in different ways. I do honestly struggle to attract the bigger clients as they often tend to look for certain big consulting brands to give them that certain ‘security’ and if something then goes wrong they can always claim in defence of their decision, “well X consulting co” recommended this approach. Often the selection process is one of the constraining dynamics smaller service providers have to work hard to overcome and balance. Expertise and outcomes has to be seen and valued for the potential to justify delivering ‘great value’ from any work done very much more upfront. Specialists like me, can and do invest far more in focused innovation knowledge. I see this in many areas where specialisation can really score if the client ‘see’s the value but there though, is often the rub, getting them to ‘see it’ and ‘engage’ early enough is difficult particuarly if you go through a central procurement proceedure. It becomes often an onerous route when you have limited resources to go through the selection process, often not getting into meaningful discussions with the person charged with implementing the solutions. Also within innovation much of the emerging work simply has rawer edges to it as innovation itself needs to be explored. Clients want to push innovation ‘out’ and achieve real competitive advantage but reluctant to do this through the smaller, less known consultant, they look for the ‘reputation tag’ yet the bigger consultants are failing to invest in leading edge thinking, offering a ‘catch 22’ situation. I would always argue if any innovation is managed thoughtfully and piloted well in its introduction the ‘risk’ is no different than thousands of other decisions made within organizations on new adoption of technology, changes in processes or launching new products, actually much less. Also smaller advisory firms can be far more personal and collaborative in far greater, more flexible ways, and often at lower costs. Just don’t expect them to underpin those internal weaknesses often encountered with hordes of young consultants that implement the solution and then leave and the association with innovation leaves with them! Smaller firms usually want to be there at the implementation outcome but in different ways than the bigger guys, looking more to be judged on the results and sharing in the ‘vested’ outcome, as they are wanting a far more lasting relationship built on good value, commitment and trust, a valued advisor. Certainly some of the conclusions from this report I have drawn out have some potential opportunities but also provides much cold comfort for innovations future, as it does seem to be constrained, if these findings are right. In some ways it offers a bleak future for innovation consulting unless things change. I think pictures tell a thousand words, in this case four tables from the report. Table taken from the Study "Management innovation in the UK consulting industry" by Dr. Joe O'Mahoney. I really feel the ‘modifications to existing practices’ serves up much of the same, with the costs spread out across multiple clients is not great consulting practice. Equally tapping into existing other practices for making ‘changes to internal processes’ utilizes Six Sigma, BPR and other consulting practices but this is not innovation. Innovation is hanging on the coat tails of other pactices, more often around efficency and effectiveness. Also relying on conducting (often) COO surveys to provide often the ‘thought leadership’ leaves a lot of room for improvement from what I have been reading where many leading consultants do not underpinning suggestions or observations with solutions. The client leads, consultants follow, it seems in what I take from this table. For me, selecting innovation consulting is not so much in the way they differentiate but in what they can clearly deliver in depth of understanding, that comes more in demonstrating this knowledge and excellence. Thankfully this table has the two as the most important but I’d suggest demonstrating knowledge leads to differentiating when it comes to innovation, or should. Demonstrating knowledge leads, differentation comes out of this. Also with a centralised procurement, at many of the clients that seemingly hampers according to the report, are playing an increasing role in the final decision of which ‘bid’ to accept. I really wonder how procurement officers can assess results for managing innovation, as much of the standard critera is on assessing the returns on investment. Innovation is far more longer term, sometimes speculative and tougher to quantify. This must cause problems for wanting to ‘push out’ on bigger innovation with consultants for those responsible, arguing for more imagination (and risk) around greater disruptive thinking and business models yet struggling to provide procurement the result criteria to validate this? If you have clients taking ‘minimal risks’ and you have a lack of time to think about ways to innovate you are certainly in a constrained market. Then add in clients (lack of) budgets for innovation and low demand for services it really adds up to a grim picture of seeing how you can lift the innovation consultants lot from just providing incremental support in my opinion. I also think I’ve got some answers to this but those are more for my opportunities to offer a ‘decent’ alternative, if wanted! So seeing that the constraints are increasing over time in this table is worrying for me. Without the client demand for going beyond present more incremental and collaborative innovation, except for sharing joint initiatives that are sometimes likely to be mutually exclusive, the consultant has no real incentive to ‘invest’ in expertise and break out of this cycle. A lack of ‘bench strength’ of innovation specialists, a reluctance due to uncertainty and consulting in innovation (often intangible and not solution specific without serious work) the consultant industry is reluctant to make deeper investments really concerns me. To finish on the foreword may seem a strange place but the right one. The Institute of Consulting council chair, Judy Craske, offers in her foreword the challenges that need to be addressed as innovation consulting will remain constrained unless it makes some radical changes based on changing economic conditions. She remarks: “As international, national and even local economies change and react to markets in turmoil; our clients’ outlooks reflect these changes, often defensively. Consultancies need to identify and respond to these factors, and then modify their responses to fit their clients’ changing needs and expectations. Developing creative capital within the industry will remain essential”. She goes on to state: “Whether lone practitioners or multi-disciplinary practices, consultants need to become more innovative and adaptive in their proposals, methods and solutions, while traditional client/consultant boundaries need to be challenged, stretched and even broken”. Her most important point from my perspective was the following: “Consultancies may also need to be more open to partnership working with other agencies, such as academia or even competitors, if they are to respond effectively to the pressures of the current high-cost, low-resource business environment”. This point on collaboration is for me the most potentially potent- if only larger consultants learnt to collaborate more with others within the provision of ‘services’ – it not only spreads costs, allows for greater potential for fresh thinking but brings into play a richer ecosystem platform of innovation advice to offer clients and that is where we should be heading I feel. I certainly drew out a lot from this study, by Dr Joe O’Mahoney. There is much to ponder from my own business perspective deriving from this study and I feel it does gives us all involved in providing consulting or advisory services some real food for thought involved on providing innovation services differently. Innovation does needs to advance, consultants can help in this. I believe this can be far more than it is as at present and perhaps the CEO who consistently laments about his innovation performance might raise the game by reducing one of the constraints perhaps holding innovation back and reflect on this constrained client- consulting relationship around innovation. For all their sins, consultants and advisors should be really rich sources of external advice on innovation but it needs greater investment and recognition of mutual value and potential to break into this current relationship. This report lifts the lid well for reflecting on the challenges and offers some sound advice to move forward. One big issue for me is “should the current client/ consultant consulting model for innovation services change for these tougher times?” I for one, believe it should be changed- not just for personal reasons but I believe you cannot ignore any ‘unturned stone’ when it comes to wanting to manage innovation well in such volatile times where innovating successfully has plenty of uncertainly but still really does hold out the promise for a better future. It does seem both consultants and clients are acting defensively, it’s a little the opposite of what you would expect in ‘pushing’ for innovation in leading practices and many clients and markets desperately seeking growth. This growth does comes from pushing at the edges not staying in the comfort zone . The Copyright for this report is with the Chartered Management Institute ©. All rights reserved. Except for the quotation of short passages (and in this case selected tables) for the purposes of criticism and review has been granted.